Seattle, Washington, 2018-Aug-31 — /Travel PR News/ — Alaska Airlines is ready to touch down in Buckeye Country. The airline announced today (Aug 29, 2018) it will begin daily nonstop service between Seattle-Tacoma International Airport and John Glenn Columbus International Airport in Ohio. 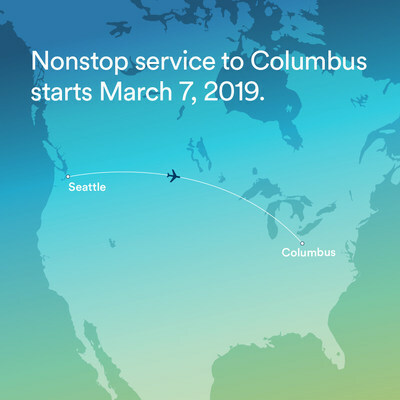 The new service, which is scheduled to begin March 7, 2019, will be the only nonstop flight offered between the Pacific Northwest and Central Ohio. Columbus is the largest city in Ohio and the 14th largest city in the nation. It’s also home to The Ohio State University, one of the largest universities in the country and home of the Buckeyes. Alaska currently operates an average of 31 daily flights from the West Coast to 10 Midwest cities, which includes Chicago; Detroit; Indianapolis; Kansas City, Missouri; Milwaukee, Wisconsin; Minneapolis; Oklahoma City; Omaha, Nebraska; St. Louis; and Wichita, Kansas. From Alaska’s main hub in Seattle, guests can travel nonstop to 89 destinations. Columbus becomes the 90th nonstop destination this spring. Tickets for the new Seattle-Columbus service go on sale today. To purchase, visit www.alaskaair.com or call 1-800-ALASKAAIR (800-252-7522 for Hearing & Speech Impaired (TTY): Dial 711 for Relay Services). This entry was posted in Airlines, Airports, Flights, Travel, Travel Services, Travelers and tagged Alaska Airlines, Central Ohio, Columbus, flight, John Kirby, Joseph R. Nardone, Pacific Northwest, Seattle. Bookmark the permalink.